PLEASE READ THESE TERMS AND CONDITIONS CAREFULLY BEFORE USING THE ONLINE SERVICES OF THIS WEBSITE. BY USING THE ONLINE SERVICE, YOU AGREE THAT YOU HAVE READ THESE TERMS AND CONDITIONS AND THAT YOU ACCEPT AND AGREE TO BE BOUND BY THEM. "Customer" or "Customers" or "you" or "your" shall mean you and all other persons who places an Order to purchase the Products on this website under your Login. "ayujayamas" or "we" or "us" or "our" shall mean Ayu Jayamas Sdn. Bhd. (Company No. 917671-X) who is the seller of the Products by Ayu Jayamas Online Store. "Ayu Jayamas Online Store" shall mean the medium by which Products are offered for sale by Ayu Jayamas Online Store to the Customer through this Internet website owned by Ayu Jayamas Online Store. "Intellectual Property" shall mean inventions, literary and artistic works, and symbols, names, images, and designs for which intellectual property rights are recognized, including (without limitation) patents, designs, present and future trademark or copyright, trade name, trade dress, trade secrets, and service marks and other property rights (whether or not registered or registrable by any means), and the right to file an application for registration and protection of any of the foregoing. "Login" shall mean a Customer's access name to Ayu Jayamas Online Store under that Customer's registration. "Order" or "Orders" shall mean the order(s) submitted by you to purchase the Product from Ayu Jayamas Online Store under your Login. "Product" or "Products" shall mean any and all the products offered for sale by Ayu Jayamas Online Store. "Terms and Conditions" shall mean the terms and conditions contained herein including any modifications and amendments or additions thereto from time to time. All the Products sold by Ayu Jayamas Online Store through this site are sold subject to these Terms and Conditions. By submitting your Order for processing by Ayu Jayamas Online Store, you confirm and affirm that you have read, understood and agree to the Terms and Conditions in the form in which they appear at the time your Order is submitted for processing. The Customer shall agree to complete the registration process according to Ayu Jayamas Online Store requirements as stated on this site. The Customer shall provide Ayu Jayamas Online Store with complete and updated information which shall include (but shall not be limited to) the Customer's legal name, address, telephone and fax numbers (optional) and e-mail address. If the Customer provides any information that is untrue, inaccurate, not current or incomplete (or becomes untrue, inaccurate, not current or incomplete), Ayu Jayamas Online Store has the absolute right to suspend or terminate the registration of such Customer and/or refuse any and all its current or future use of this site. Registration is open to residents in Malaysia aged 18 and above. Ayu Jayamas Online Store has the absolute discretion to refuse the registration of a potential Customer for any reason whatsoever and to terminate the registration of any of its Customers for any reason whatsoever. Once the Customer has completed and submitted its registration, we shall deem that the Customer has opted in to receive email communication and text message from us and the Customer shall be responsible for all charges imposed by the Customer’s mobile phone carrier, if any. The Customer shall be liable for every Order made under his/her Login and agrees to indemnify Ayu Jayamas Online Store for all claims, damages whatsoever made by any third party arising from the actions of a person placing Orders for the Products using the Customer's Login. The Customer shall be responsible for updating his registration information. The Customer shall immediately notify Ayu Jayamas Online Store in the event of any unauthorized use of the Customer’s Login. The Customer may place his Order via Ayu Jayamas Online Store at: http://ayujayamas.com After placement of Order, the Customer will receive an email acknowledging receipt of Order. For clarification, such acknowledgement of receipt of Order does not constitute confirmation of acceptance of Order and it does not guarantee stock availability. The inclusion of any Products or services on this site at a particular time does not guarantee that the Products or services will be available at all time. We shall not be obliged to supply the Product to you until we have accepted your Order by sending you a subsequent email confirming our acceptance of your Order. Ayu Jayamas Online Store shall make every effort to fulfill Orders placed by Customers through the Ayu Jayamas Online Store, but we shall not be liable to any person if we shall decline to accept all or part of an Order for whatsoever reason, including but not limited to an unforeseen change to the Products (as the case may be), or because the Products may be unavailable. If applicable, we will proceed to fulfill the remainder of the Order in accordance to these Terms and Conditions. Access to Ayu Jayamas Online Store is gained through use of a personal password. The Customer shall ensure that the password is kept strictly confidential to prevent unauthorized use. The Customer shall accept responsibility for all activities that occur under the Customer’s Login and password. Ayu Jayamas Online Store shall use its best endeavors to prevent any unauthorized entry to the Ayu Jayamas Online Store Internet site. However, Ayu Jayamas Online Store shall not be liable for any damages or losses whatsoever if any third party gains unauthorized access to the Ayu Jayamas Online Store Internet site. All pictures and images of the Products displayed on this site are for illustration purposes in order to help the Customer to recognise the Products only. The actual size, dimension and colour of the Products may differ and these may not reflect exactly on the pack you receive due to packaging redesign and improvements. Unless otherwise stated, all prices quoted are in Malaysia Ringgit. Where applicable, you shall be charged according to the prices stated in this site and such other miscellaneous charges such as delivery charges, administrative charges and service charges, inclusive of goods and service tax (GST). Ayu Jayamas Online Store shall make every effort to ensure that the prices, details and sizes of Products detailed by the Ayu Jayamas Online Store are correct at the time when the information was inputted onto the system but Ayu Jayamas Online Store reserves the right to vary the price and other details, descriptions or specifications of the Products without notice. The prices advertised by the Ayu Jayamas Online Store are for home delivery shopping only. Prices for some Products may differ from those charged at Ayu Jayamas Online Store. The price of certain Products is subject to change without prior notice based on market price fluctuation and promotions. Not all Products sizes will correspond exactly to the description offered by Ayu Jayamas Online Store. Ayu Jayamas Online Store reserves the right to provide the nearest size of Product at the nearest price subject to the availability of Products. Discrepancies between the on-line bill/Order price and the final bill may be due to out-of-stock products, substitutions, special offers and daily price changes. Ayu Jayamas Online Store reserves the right to adjust the final bill after the on-line bill/Order price is presented or conveyed to the Customer and such adjustments shall be marked on the final bill presented to the Customer at the time of delivery. In the event of different special offers or promotions being made available to the Customer simultaneously for the same Product, the Customer may select one such offer or promotion per Product but shall not be entitled to a combination of all such offers or promotions per Product. Ayu Jayamas Online Store may from time to time set credit limits for individual Customers and reserves the right to limit sales and quantities of Products including the right to prohibit sales to re-sellers and to revise, suspend or discontinue a Product, sale or promotion at any time without prior notice to the Customer. All payment in respect of an Order must be cleared before delivery of the Products. If the payment cannot be processed, the said Order will be rejected and the Customer is advised to contact its card issuer to resolve any problem concerning the use of its credit card in order to continue with the Order. Ayu Jayamas Online Store may change at any time the method by which payments for Ayu Jayamas Online Store Orders may be effected and such changes may be notified to the Customer by e-mail or by placing a notice to this effect on the Ayu Jayamas Online Store Internet site. If payment to an Order has already been made but the Order is rejected by Ayu Jayamas Online Store or cancelled by the Customer before we accepting the Order, you will be entitled for your refund but the receipt of the refund will depend on the period of time your financial institution takes to finalise the refund. Ayu Jayamas Online Store shall not be liable with respect to any loss, damage, cost or expense that you or any person may incur as a result of any delay in your financial institution processing the said refund. Ayu Jayamas Online Store shall use reasonable endeavors to deliver Products of acceptable quality to the delivery address specified and keyed in by the Customer but Ayu Jayamas Online Store cannot guarantee any firm delivery time and Ayu Jayamas Online Store shall not be liable for any delay in its delivery services, if the delay has been due to causes beyond the control of Ayu Jayamas Online Store. Your Order will be delivered to you via the service of a courier service company of our choice. At this juncture, delivery service is extended to Malaysia only. Please allow five (5) working days for Peninsular Malaysia and eight (8) working days for East Malaysia including Labuan for processing from date of Ayu Jayamas Online Store confirmation of acceptance of an Order within the aforesaid areas unless otherwise notified by Ayu Jayamas Online Store. Please note that we will not accept delivery to a P.O. Box address and it might not be possible for delivery to some locations within the aforesaid areas in certain circumstances. If delivery to some locations is not possible, we may contact you to arrange for delivery to an alternative address. Delivery Charges will be calculated based on the weight of the Order received you can refer delivery information know more about the detail. No delivery services shall be available on Sunday & public holidays. 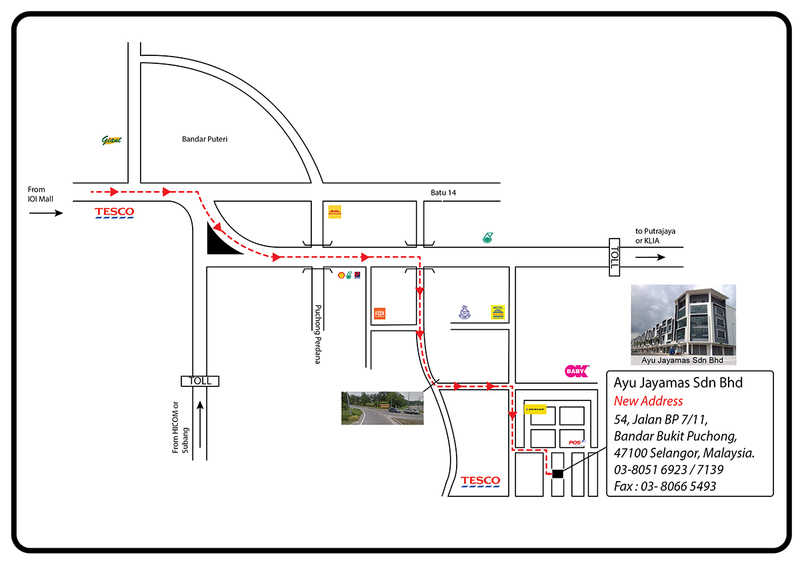 The Customer is to notify Ayu Jayamas Online Store immediately of a change to his delivery address and contact number. Where Customer is not available to receive the delivery, a notification card will be left at the delivery address. An attempt will be made to contact the Customer for a second delivery. If Customer is still not reachable at second attempt, a notification card will be left for the Customer to collect the Products from our office. If delivery is delayed due to the Customer’s undue delay or unreasonable refusal to accept delivery or if the Customer fails or refuses to collect the Products within seven (7) days from the date of second notification, the Order will be deemed void and has no further effect but the Customer shall bear all the relevant cost incurred by Ayu Jayamas Online Store (including but not limited to the delivery cost and administrative charges). If the Customer is not personally available to accept delivery, a representative may accept delivery on behalf of the Customer provided always that the said representative must be over 18 years of age and capable of receiving the delivery. The Customer or its representative may be required to produce proof of identity on delivery or collection of Products and all deliveries shall be signed off by the Customer or its representative on the delivery invoices. Ayu Jayamas Online Store reserves the right to withhold delivery of the Products to the Customer if it has any doubts whatsoever as to the Customer's credit worthiness or insufficient identification. The Customer may cancel the Order up to the point in time before Ayu Jayamas Online Store has confirmed its acceptance of the Order and the Customer will not incur any cost in doing so. If the Customer wishes to vary its Order, the Customer is required to first cancel the said Order and to replace it with a new Order thereafter. Such cancellation and/or variation of Order is only allowed if the same is performed and notified to Ayu Jayamas Online Store within 24 hours from the initial Order is made by the Customer. Subject to the Customer's consent, Ayu Jayamas Online Store may substitute a Product for another similar Product if the initial Product ordered by the Customer is unavailable. If there is no prior consent from the Customer for a substitution, no substitution shall be made. All risk in the Products shall pass to the Customer upon delivery to the Customer's delivery address but Ayu Jayamas Online Store shall retain title in the Products until such time as payment for the Products has been effected. All right, title and interest in all Intellectual Property in all concepts, systems, written, graphic and other material relating to Ayu Jayamas Online Store in this website and all text, graphics, photographs, forms, diagrams and other materials published on it shall at all times remain the property of Ayu Jayamas Online Store. You may not copy, reproduce, republish, upload, download, post, transmit, store in retrieval system, modify, alter or display in public or distribute in any way the contents or any part of this site for any purpose without Ayu Jayamas Online Store prior written permission. Ayu Jayamas Online Store and other parties own the trade marks, logos and service marks displayed on this site/catalogue and/or in connection with the Products and the Customers and on-line visitors are prohibited from using the same without the written permission of Ayu Jayamas Online Store or such other parties. No right or license is given to any party accessing this site to use or reproduce in any manner any such marks or logos and Ayu Jayamas Online Store will not hesitate to enforce its right against such party. Ayu Jayamas Online Store reserves the right to amend these Terms and Conditions from time to time or at any time in its sole discretion. Ayu Jayamas Online Store may, but does not undertake, to notify the Customer of such changes. It is the Customer's responsibility to review the Terms and Conditions prior to submitting any Order and Ayu Jayamas Online Store shall have no responsibility to notify the Customer of any changes to the Terms and Conditions prior to the coming into effect of such changes or otherwise. The Ayu Jayamas Online Store internet site may contain links to other sites and pages which are not maintained or controlled by Ayu Jayamas Online Store and for which is not responsible. When you activate any of these links or pages you leave this site and access to such site or page is at the Customer’s own risk for which Ayu Jayamas Online Store disclaims all responsibility and liability. Ayu Jayamas Online Store disclaims all liability to information or materials posted by advertisers or sponsors on this site. All reasonable efforts are made to ensure that the information provided on this site is correct and up-to-date. However, the information may contain any errors, mistakes, omission or inaccuracies and Ayu Jayamas Online Store reserves the right to correct any errors, mistakes, omission or inaccuracies. To the extent permitted by law, Ayu Jayamas Online Store disclaims all implied and/or express warranties and makes no representation as to the accuracy or completeness of any information on the site and Ayu Jayamas Online Store takes no responsibility and assumes no liability for the content of the site or anything posted on or linked to it. Neither the materials nor any information contained on this site constitute a solicitation. Such materials and information are provided for information purposes only and may be modified, deleted or replaced from time to time and at any time at Ayu Jayamas Online Store sole and absolute discretion. Customers' information and private transaction data are protected using 128-bit Secure Socket Layer (SSL) encryption. SSL encryption is an Internet security protocol used by Internet browsers to transmit sensitive information. We test our systems periodically to ensure there are no possible breaches of our security and that our Customers’ security and confidential policy information is not compromised in any way. THIS SITE AND ALL INFORMATION AND MATERIALS CONTAINED IN IT ARE PROVIDED "AS IS" WITHOUT ANY WARRANTY OF ANY KIND EITHER EXPRESS OR IMPLIED INCLUDING BUT NOT LIMITED TO ANY IMPLIED WARRANTIES OR IMPLIED TERMS AS TO TITLE, QUALITY, MERCHANTABILITY, FITNESS FOR PURPOSE , PRIVACY OR NON-INFRINGEMENT. Ayu Jayamas Online Store HAS NO LIABILITY OR RESPONSIBILITY FOR ANY ERRORS OR OMISSIONS IN THE CONTENTS OF THE SITE. Ayu Jayamas Online Store ASSUMES NO RESPONSIBILITY AND SHALL NOT BE LIABLE (TO THE EXTENT PERMITTED BY LAW) FOR ANY DAMAGE OR INJURY ARISING OUT OF ANY USE OF OR ACCESS TO THE SITE/CATALOGUE, OR ANY FAILURE OF PERFORMANCE, ERROR, OMISSION, INTERRUPTION, DELETION, DEFECT, DELAY IN OPERATION OR TRANSMISSION, COMPUTER VIRUS, COMMUNICATION LINE FAILURE, INTERCEPTION OF ONLINE COMMUNICATION, SOFTWARE OR HARDWARE PROBLEMS (INCLUDING WITHOUT LIMITATION LOSS OF DATA OR COMPATIBILITY PROBLEMS), THEFT, DESTRUCTION OR ALTERATION OF THE SITE, WHETHER FOR BREACH OF CONTRACT, TORTIOUS BEHAVIOUR, NEGLIGENCE OR, UNDER ANY OTHER CAUSE OF ACTION RESULTING DIRECTLY OR INDIRECTLY FROM ANY ACCESS OR USE OF THE SITE/CATALOGUE, OR ANY UPLOADING, DOWNLOADING OR PUBLICATION OF DATA, TEXT, IMAGES OR OTHER MATERIAL OR INFORMATION TO OR FROM THE SITE. The headings and sub-headings in these Terms and Conditions are inserted merely for convenience of reference and shall be ignored in the interpretation and construction of any of the provisions contained herein. No failure on the part of Ayu Jayamas Online Store to exercise, and no delay on Ayu Jayamas Online Store part in exercising, any right or remedy under these Terms and Conditions will operate as a waiver thereof, nor will any single or partial exercise of any right or remedy preclude Ayu Jayamas Online Store for further exercise thereof or the exercise of any other right or remedy. If any provision or any part of any provision of these Terms and Conditions which are illegal, void prohibited or unenforceable shall be ineffective to the extent of such illegality, voidness, prohibition or unenforceability without invalidating the remaining provisions hereof and any such illegality, voidness, prohibition or unenforceability shall not invalidate or render illegal, void or unenforceable any other provision contained herein. These Terms and Conditions shall be governed by and construed in accordance with the laws of Malaysia and the Customer and Ayu Jayamas Online Store hereby agree to submit to the jurisdiction of the Court of Malaysia. making such disclosures as may be required for any of the above purposes or by law. You further agree that Ayu Jayamas Online Store may disclose and transfer (whether in Malaysia or abroad) to Ayu Jayamas Online Store agents, contractors, partners, advertisers, network operators, associated companies, any relevant financial institutions, any other persons under a duty of confidentiality to Ayu Jayamas Online Store, any company within its group, any referee whose details are provided by you and any of Ayu Jayamas Online Store actual or proposed assignees or transferees of Ayu Jayamas Online Store rights with respect to you to use, disclose, hold, process, retain or transfer such Personal Data for the purposes of A1 herein for and on behalf of Ayu Jayamas Online Store. We may also use your Personal Data to send you promotional information about other third parties which we think you may find interesting. If you do not want to receive such information or for us to disclose, transfer or use your Personal Data for any of the purposes of A1, you may contact us in writing at the address set out in E2 below. Please note that in the event that sufficient Personal Data is not supplied, or is not satisfactory to Ayu Jayamas Online Store then your application or request to Ayu Jayamas Online Store for any of the above purposes of A1 may not be accepted. Any Personal Data supplied by you will be retained by Ayu Jayamas Online Store as long as necessary for the fulfillment of the purposes stated in A1 herein or is required to satisfy legal regulatory, accounting requirements or to protect Ayu Jayamas Online Store interests. Any questions, comments, suggestions or information other than Personal Data sent or posted to the site, or any part of the site by visitors will be deemed voluntarily provided to Ayu Jayamas Online Store on a non-confidential and non-proprietary basis. Ayu Jayamas Online Store reserves the right to use, reproduce, disclose, transmit, publish, broadcast and/or post elsewhere such information freely, including passing it to any associated company for example, in connection with the development, manufacture and marketing of products and services and to meet customer needs. All reasonable efforts and practical steps are made to ensure that any Personal Data held by Ayu Jayamas Online Store is kept up-to-date and is protected against any loss, misuse, modification, unauthorized or accidental access or disclosure, alteration or destruction. Our website may contain links to other sites and pages. By activating a link, such as for example by clicking on the banner of an advertiser, you leave our web site and Ayu Jayamas Online Store does not exercise control over any Personal Data or any other information you give to any other entity after you have left our web site. Under the Act, you have the right of access to your Personal Data held by Ayu Jayamas Online Store on payment of a prescribed fee and to request correction of the Personal Data that is inaccurate, incomplete, misleading or not up-to-date.